The City Chapter was very pleased to welcome Anne Doughty back to her home city to celebrate the publication of her latest book, called ‘Come Rain, Come Shine’. This is Anne’s twelfth novel and completes a century in the life of the Hamilton family of Armagh. 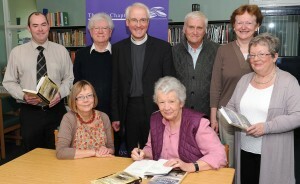 Anne said, “I had no idea when I returned to Ulster in 1998 with a sketch of a novel based on a childhood in the Armagh area in the 1940s that my story would expand to stretch across a century, or that it would fulfil my childhood ambition to write ‘stories about here’, because all the stories I read in my own childhood were about remote places and people I didn’t know. In the spring of 2000, writing about the scents and sounds of a May evening when young Clare Hamilton paused for a break from her studies in ‘On A Clear Day’, I thought of her grandmother and great-grandmother. They beckoned to me. That was the beginning of the Hamiltons’ sequence. To have fulfilled that ambition with the richness of resource available to me both from the libraries in Armagh and progressively available on line has to be the best of times”. The Library and No 5 are closed on Bank Holidays, Morning/Afternoon on the Hill group visits and special events. Please check our calendar for special closures before making your journey!